One of the challenges sales teams face on a daily basis is to pinpoint their products' strengths over the competition. DataMaster strive to give users of our benchmarking suite, DMO the means to do this ever quicker and ever better. 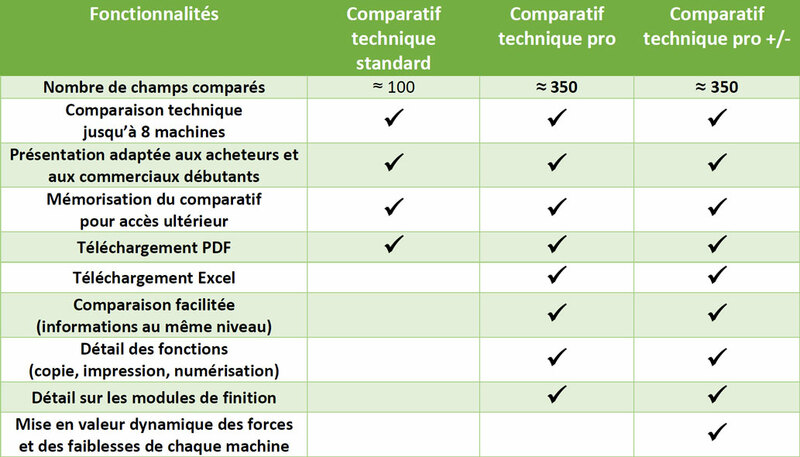 Now we have added more to the printer technical comparison tool. It already includes over 350 fields of technical specifications, and DMO users can compare up to eight machines at once - and output the results to PDF or Excel format. Sales teams armed with DMO tools can send these comparisons on to their customers as PDF or use the Excel report for further analysis. Now the report is presented in color, allowing DMO users to see at a glance which machine has the best specs! Green for good, red for the poorer results in each comparison. The coloring is dynamic, so whatever the comparison, the best results come out in green. This new way of presenting comparisons of technical specs helps Make More Sales, Faster! and is intended to help DMO users make a better business approach. It helps anticipate objections, and to prepare answers. The new technical comparison tool will be out on June 15 2015.